How Effective Is Manuka Honey at Treating All Forms of Staph Infections? Staphylococcus species, or staph, are round bacteria commonly found on the skin, genital tract, nose and mouth as part of the normal flora. Staph family includes around 30 different bacterial species that can cause a wide range of infections such as folliculitis, cellulitis and toxic shock syndrome. Methicillin-resistant Staphylococcus aureus is type of staph that is resistant to most common antibiotics and leads to life threatening infections, especially in people with reduced immunity. Along with antibiotic therapy, certain natural foods such as manuka honey may also help control staph infections. Honey is the nectar from the flowers that has been concentrated and processed by the bees. Manuka honey is made by the bees that frequent only the manuka, or Leptospermum scoparium, native to New Zealand. Phyochemicals and the high sugar content of manuka honey are responsible for its antibacterial activity. The thick, golden-brown, syrupy liquid has been used traditionally to treat several conditions including ulcers, infected wounds and certain hospital-acquired infections. Manuka honey has a bitter taste and is generally not used as a food. The studies with regards to dosage are limited so talk to your doctor to establish a proper regimen if you plan to use it for medicinal purpose. The phytochemicals of manuka honey play a major role in inhibiting the growth of MRSA in the laboratory, according to a study published in the November 2002 issue of the "Journal of Applied Microbiology." Although, hydrogen peroxide found in regular honey can also be effective against MRSA in the laboratory, an enzyme called catalase found in the blood may break the peroxide before it reaches the bacteria in the body. Manuka honey may be more useful in actual clinical cases, say the authors of the study. The National Geographic News also reported in September 2009 that some unidentified compounds of manuka honey make it more effective than regular honey in inhibiting the growth of MRSA in the laboratory. Beatrice Trum Hunter, author of the book "Infectious Connections," also reaffirms that applying manuka honey to wound dressings helps control staph infections. Manuka honey is generally safe to use but its natural acidity may irritate the skin in some patients. It may also elevate blood sugar levels and cause allergic reactions occasionally. It may also interfere with certain chemotherapy drugs. You must talk to a doctor before using manuka honey to treat staph infections. 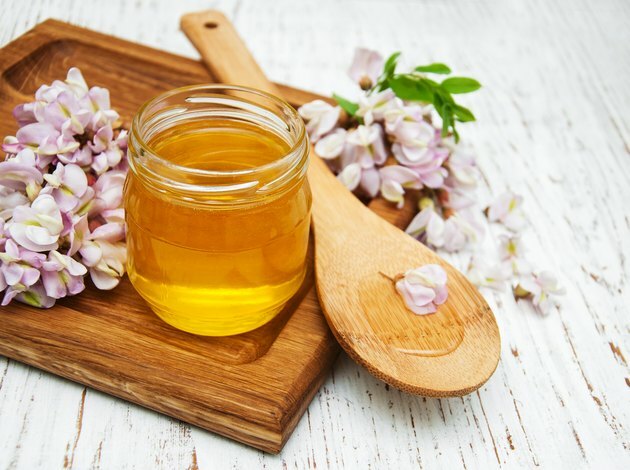 Remember that the Food and Drug Administration does not regulate the production of manuka honey products in the United States, so make sure the product has been tested for its safety. You may also look for the USP logo, which is awarded to products that have been voluntarily submitted to safety tests by the United States Pharmacopoeial Convention.